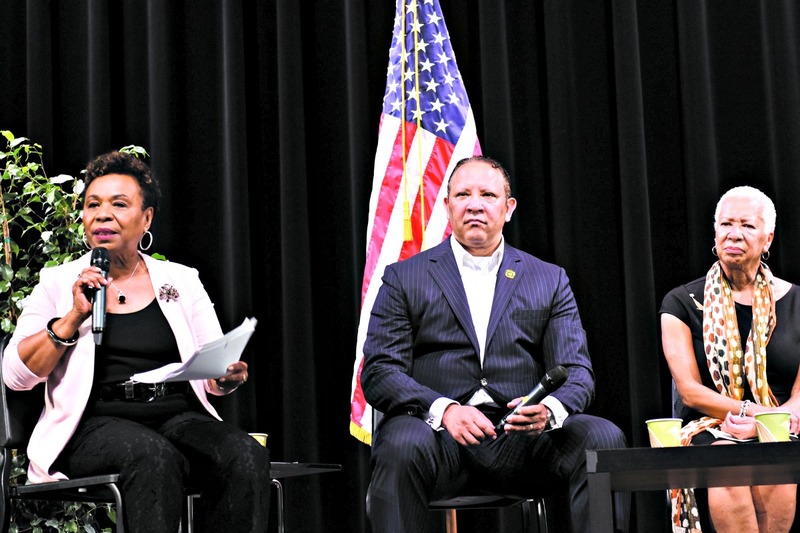 Left to right: Congresswoman Barbara Lee, Marc Morial and Angela Glover Blackwell spoke Wednesday evening in Oakland about the risk of President Trump´s policies to African Americans. Photo by Ken Epstein. Congresswoman Barbara Lee hosted a community forum this week to answer the question posed by Donald Trump to African Americans during his campaign: “What do you have to lose?” The event was held Wednesday evening in the auditorium of Castlemont High School in East Oakland. Discussing the impact of President Trump’s policies on African Americans and strategies for building the resistance were a panel of speakers hosted by Congresswoman Lee: Marc Morial, president of the National Urban League, East Bay Assemblyman Tony Thurmond, BART Director Lateefah Simon and Policy-Link founder and CEO Angela Glover Blackwell. “President Trump and his administration are actively undermining progress for the African American community, and we must resist all attempts to roll back progress. Everyone is hurt by unfair polices, and, like Dr. King said, an injustice anywhere is a threat to justice everywhere,” said Congresswoman Lee. Morial, who is visiting California on an organizing tour for the Urban League, is the former mayor of New Orleans and a Louisiana State Senator. “In this political climate, it is imperative that we unify as a community to advocate for a plan that protects and furthers the progress of African Americans,” he said. BART Director Simon discussed the federal attacks on criminal justice reform. Join us for an informational Social Security Consultations at the Oakland Public Library. advanced filing strategies that could increase your lifetime benefit. Seating is limited, so sign up today!